Instructions: Prepare a 7 x 7" card base. To achieve this, cut white cardstock 7 x7", and another 7 x 8", score and fold on the 7-inch line and use the Dries Clear Adhesive and connect the 2 together. Cut a piece of the Buttons and Blooms paper down to 6 7/8 x 6 7/8" and layer on top. Cut another piece of the Buttons and Blooms paper 6 x 6" card fronts, stamp the sentiment on the right side of the card front. Place foam dots to the back, adhere to card. Cut out 2 of the Hand stitched frames, cut the dies off and place foam dots to the back, add to the card base as shown making it look more like a square frame. 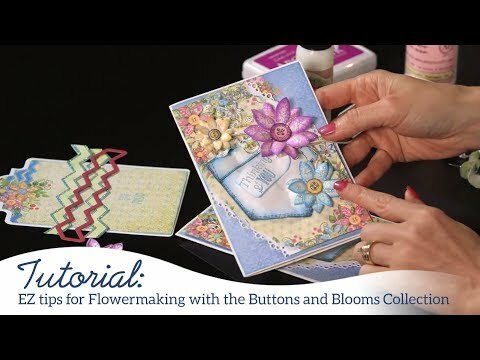 Stamp the flowers on the blue, yellow and rose colored card stock with the matching ink colors. Cut out with the coordinating die, shape using the Flower Shaping Kit, add prills to the center of each flower and set aside. 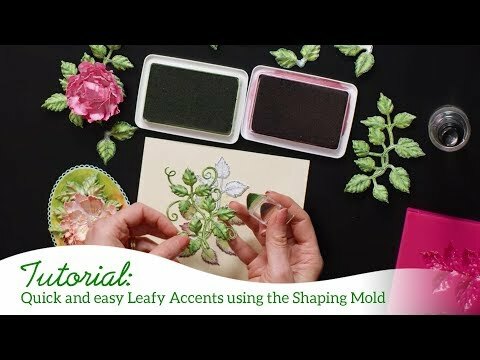 Stamp the leaves on green cardstock with the Library Green ink, cut out with the coordinating die, place in the leaf mold stamped side down, spray a small amount of water, run through the die cut machine and ink the edges with the Library Green ink. Adhere to the left side of the card. Add flowers on top of the leaves. Stamp the arrow, sentiment on white cardstock with the Manganese Blue ink, cut out with the coordinating die, add foam dots to the back and adhere to card. To finish the card, add glitter to all the leaves and flowers.